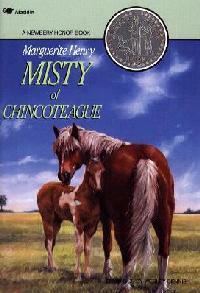 I picked up a copy of Misty of Chincoteague for one of you as well. I'm convinced that even if you aren't a lover of horse stories, you will find plenty of good reasons to enjoy this particular tale. The "Revised Version" drew me in. And makes me curious. I'd love to know what it might be. Thank you for fun giveaways! I've never read a horse book...but I would love to try this one. Well, the fact that you also bought some sequels got me. I would like to read this one! We've read this, loved it, and plan to visit the island some year for the horse pilgrimmage. A horse book of course! When I was a little girl I owned EVERY horse book ever written, I swear! This is one I loved and would love to have it on my shelf for my daughter and I to read together! I'm not a horse lover but am curious to read these with my kids. I've never been disappointed by your recommendation so I'm willing to give this one a try. My mom read these books to us as kids. If you don't have it on your list, add Brighty of the Grand Canyon for when your boys are a bit older. I remember this book from way back!